Fatty Alcohols Market Accounted For USD 7.51 Billion By 2022: Grand View Research Inc. 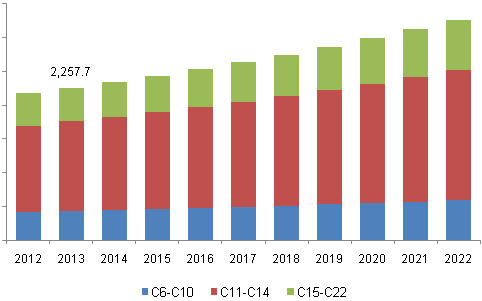 Global fatty alcohols market is expected to reach USD 7.51 billion by 2022, according to a new study by Grand View Research, Inc. Favorable government initiatives in a quest to minimize dependency on petrochemicals coupled with consumer shift towards organic personal care products is expected to drive global fatty alcohols market over the forecast period. Consistent supply of key raw material coupled with the price volatility is expected to a key challenge for market participants. Technological advancements coupled with increasing consumer preference for renewable chemicals are expected to create lucrative opportunities for market participants over the next seven years. Soaps & detergents was the most dominant application segment and accounted for 54.6% of total market volume in 2014. Growing natural surfactants and emulsifiers demand in soaps & detergents industry is expected to fuel fatty alcohols demand in this segment over the forecast period. Personal care is expected to witness the highest growth of 4.6% from 2015 to 2022. Growing consumer preference towards organic personal care products is expected to increase penetration of fatty alcohols in this segment. C11-C14 fatty alcohols were the largest product segment with a market share of over 55% in 2014. C11-C14 fatty alcohols are primarily used in the production of sodium laureth ether sulphate (SLES), a key foaming agent majorly used in body washes and shampoo formulations. Growth of personal care industry is expected to drive this product segment over the next seven years. Global fatty alcohols market is highly fragmented owing to presence of several small and medium scale companies operating particularly in Asia Pacific and Central & South America. Major companies operating in the global fatty alcohols market include Ecogreen Oleochemicals, Emery Oleochemcials, BASF, Kuala Lumpur Kepong (KLK), Oleon, Sasol, PT Muslim Mas and Kao Chemicals.